Malaysia, April 25th, 2017 - Epson announced the launch of the lightest 3LCD projector, the EB-1785W, delivering ultra-portability, superior imaging quality and a suite of connectivity features for dynamic business presentations for the mobile workforce. Weighing at up to 1.83kg and at 44mm thickness, the EB-1785W can easily be carried in a laptop bag for mobile business presentations, and are designed with grip lines at side for handy carrying. It delivers up to 3,200 lumens of colour brightness for bright and vibrant images indoors as well as outdoors, without compromise on brightness. The EB-1785W model supports HD ready resolution and is energy-saving, using just 0.34W of power in standby mode. The EB-1785W come packed with features that allow for flexibility in set up and enable seamless connectivity and usability. The projector provide real-time automatic vertical and horizontal keystone correction and adjustment features, which automatically corrects distorted images projected at any angle upon projection. For further adjustments the quick corner feature and lens shift function can be used for maximum projection, without the need to worry about the change in aspect ratio. The split screen feature enables content from two separate sources to be displayed side by side simultaneously. The projector comes with the innovative gesture presenter feature, a first of its kind, enabling users to control presentations through its touch features by moving their hands to a marker at the bottom right side of the projection screen, eliminating the need for clickers. The EB-1785W projector brings a multitude of seamless connectivity options to smart devices and laptops. The Miracast function enables screen mirroring with wireless transmission of full HD video and sound from compatible smart devices and laptops, without need for any software installation, bringing ease and convenience in setting up. 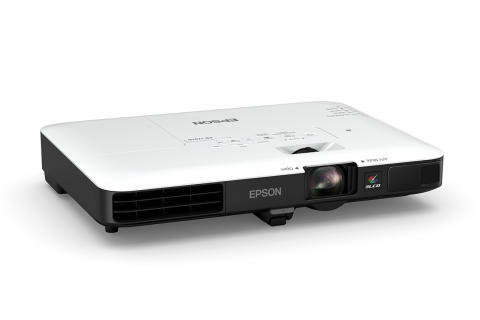 The projector comes with in-built Wi-Fi connectivity and NFC connectivity, enabling users to easily share and transmit images, texts and files from smart devices and laptops directly through Epson’s iProjection app. Remote control function is also built into iProjection for controlling of projector functions. “We have brought a new level of breakthrough technology by bringing high quality 3LCD projection into a portable compact projector to deliver the world’s lightest 3LCD projector for the mobile worker. High quality full HD quality projection is now available to users on-the-go to satisfy the sophisticated demands of today’s workforce. We are excited about the launch of this new projector, and look to continue developing new technologies for our customers,” said said Danny Lee, General Manager, Sales & Marketing, Epson Malaysia.